Your smile affirms your awareness and determination to live in peace and joy. How many days slip by in forgetfulness? What are you doing with your life? Look deeply, and smile. The source of a true smile is an awakened mind. You don't have to run into the future in order to get more happiness. It is possible to live happily in the here and the now. This capacity of waking up, of being aware of what is going on in your feelings, in your body, in your perceptions, in the world, is called Buddha nature, the capacity of understanding and loving. Reality is reality. It transcends every concept. 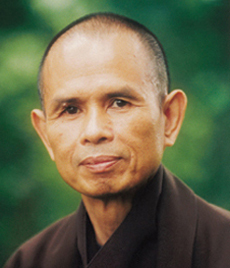 Thich Nhat Hanh is a Viatnamese Buddhist monk, writer and poet. He has had an prominent role in the development of Western Buddhism. He has written more than 100 books.